As Cox leaves baseball behind, the Braves will look to continue the run of success achieved under his guidance. They will turn to a former third base coach under Cox and previous Florida Marlins manager Fredi Gonzalez. Gonzalez, 46, has been managing and coaching between the minors and majors since 1990. He earned his first and only prior MLB managerial position in 2007 with Florida, where he remained for three and a half seasons. Gonzalez made it just over 10% of the way to Cox’s win total, compiling a 276-279 record with the Marlins. Gonzalez’s Marlins generally showcased talent but with a limited budget, they couldn’t quite break through in the National League East. The Marlins fired Gonzalez in June of 2010 in a move that was generally seen as a surprise, even in the Marlins’ clubhouse. Gonzalez had done a decent job with shallow teams. He had also shown an ability to handle a clubhouse, particularly through his careful diffusing of a rift with Hanley Ramirez after the shortstop was benched for lazily pursuing a ball in the outfield in May. Marlins executive Larry Beinfest was extremely vague in his explanation, claiming that the organization “got concerned something was missing.” For whatever reasons, the Marlins decided to move on, replacing Gonzalez with interim manager Edwin Rodriguez. Gonzalez’s reunion with the Braves was predictable from the start. In the MLB.com article linked above, Braves superstar Chipper Jones declared that everybody in Atlanta “would love to have Fredi back” and that “he knows how things work” around the Braves. Apparently (and unsurprisingly), Jones and the front office were on the same page. The Braves are coming off a solid season in which they showcased some fantastic young talent, such as Rookie of the Year candidate Jason Heyward and young starter Tommy Hanson. Personally, I think it’s extraordinarily difficult to properly evaluate managers from any point of view, much less from outside an organization, but Gonzalez appears to have a good reputation. With the situation that Cox has left in Atlanta, the playoffs should be a possibility for the near future. Expectations will be high of Gonzalez, as typically happens when a legend is replaced, but the new manager, and more importantly, his talented players, should be up to the task. We hoped you liked reading Braves Choose Fredi Gonzalez to Replace Cox by Jack Moore! 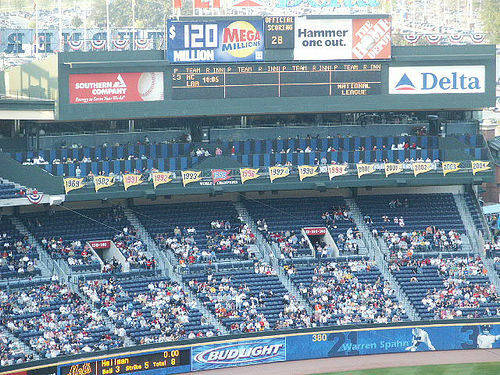 At first, I interpreted that picture as a statement on the indifference of Braves fans.